There Is No God but God. . .
We are the progeny of Caine like our Christian cousins, but we know what they do not. Muhammad came from our lands and the words revealed to him contain the secrets of our salvation. The Children of Haqim have their ways, but Islam is large and its monsters are many. 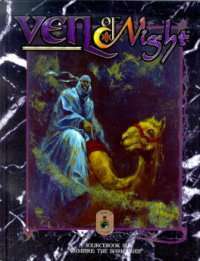 Veil of Night is a complete guide to the medieval Islamic world and the Cainites who rule its nights. From Moorish Spain and gilded Egypt to far-flung Persia and sand-swept Araby, vampires lurk. Complete details on the Muslim wings of all the clans, on new Roads and on the powerful Ashirra sect give you everything you need to play a vampire far from Christendom. The next in the Year of the Scarab™ series. This title was added to our catalog on July 18, 2005.